Learn many useful PAINTSHOP Pro 7.0 technical skills fast and easy. No special skills or experience required. Install the program from CD, and follow the animated 3D Instructor to learn PAINTSHOP Pro 7.0 easily. Learn PAINTSHOP Pro 7.0 from anywhere you are, just use your computer to run the program. 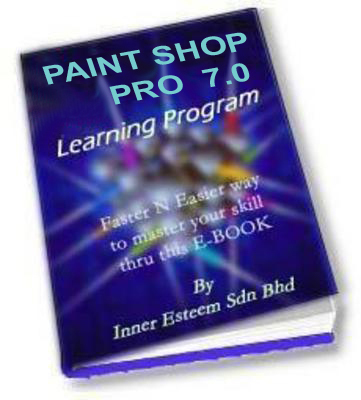 This is self paced training program for beginner, absolutely the perfect PAINTSHOP Pro 7.0 training starter at affordable price. With this low cost, you can master PAINTSHOP Pro 7.0 technical skills in a short time. After you learn PAINTSHOP Pro 7.0 confidently, then invest money on the PAINTSHOP Pro 7.0 application software. PAINT SHOP PRO 7.0 EBOOK paint;paint shop 9182565 8.99 greatbuilder Fresh Download Available!